Back to vacation, and I promise I am nearly at the end of Paris food posts! But this post is about one of my favorite places we ate. 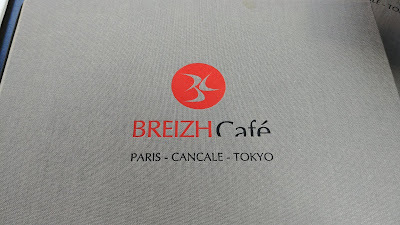 David Lebovitz recommended Breizh Cafe. 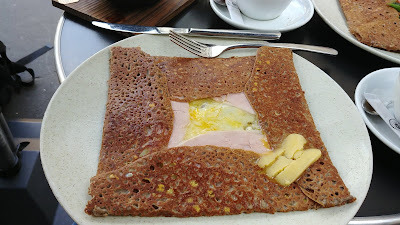 Our Left Bank Tour guide told us the best crepes were at Breizh Cafe. And while we in Paris, Bon Appetit posted an Instagram story about a day in Paris and going to Breizh Cafe. I really, really wanted to try Breizh Cafe, even though I had heard the line was long. 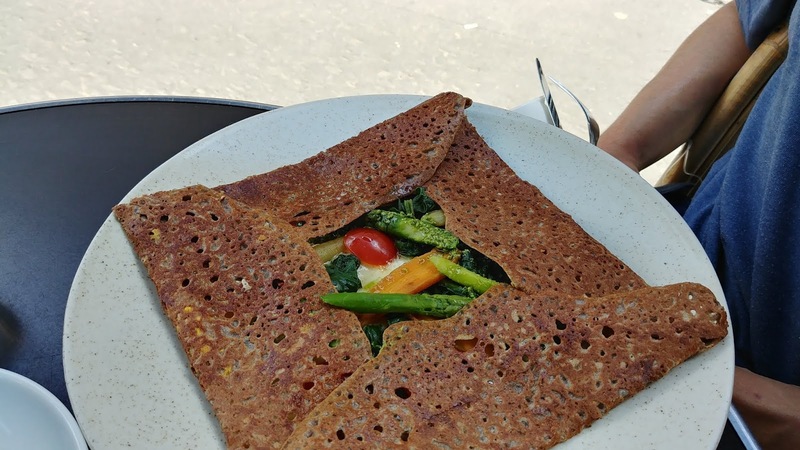 We made it our mission on a sunny Sunday to find and eat Breizh Cafe crepes (after visiting Luxembourg Gardens and the Pantheon). 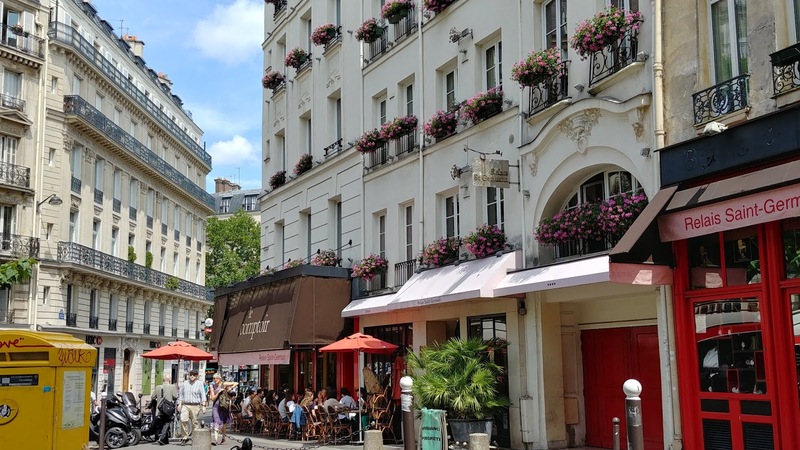 There are several locations in Paris. We went to the Rue de l'Odeon one. We got there between noon and 1 pm and were able to grab an outdoor table right away. Luckily, no waiting. The menu has English translations, so that was nice. 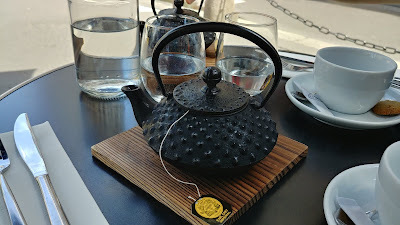 We both ordered tea and it came in these beautiful teapots. I learned a lesson at our previous crepe experience: the egg could be served runny. I wondered, were all eggs on crepes served runny? Could it be cooked? Or would that brand me as the most horrible American tourist ever? We timidly asked our server how the egg was served. I guess we were not the first to ask because right away, before we got our question out, she said the egg could be runny or scrambled. Whew! I ordered ham, cheese, and egg crepe. Look at that glorious butter melting in the corner. So good. 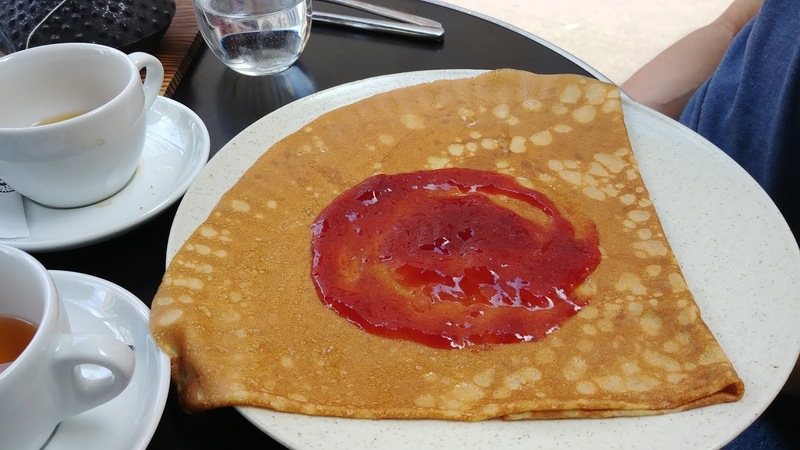 I spread it all over and ate the entire crepe. Really good. And cooked egg. SP chose a vegetable crepe with egg. There was asparagus, tomato, carrot, and I forget what else. He said it was delicious. We shared a strawberry jam crepe for dessert. It, too, was delicious. The jam was so fresh and flavorful. Maybe it was from a jar, who knows, maybe things just taste better in Paris. Our view while we sipped tea, ate crepes, and relaxed. It was definitely worth it to seek out Breizh Cafe. The crepes are delicious and they will scramble the egg for people like me! They also are very nice to those of us with limited/terrible French. We would definitely go back.